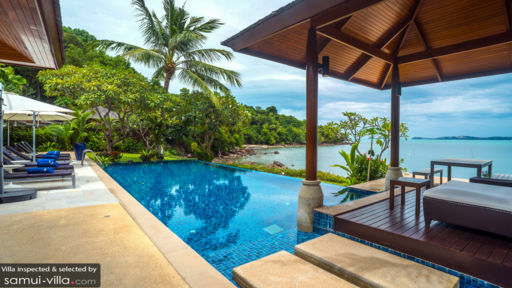 Baan Kularb is a beachfront, vacation complex composed of about two pavilions that epitomize contemporary tropical design. Interiors are appointed with predominantly finely finished as well as woven wood furnishings and fixtures along with classic, luxurious pieces. Amenities are discriminately first rate – for all-out guest delight and enjoyment. 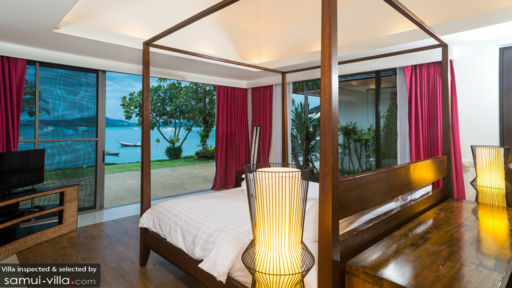 Baan Kularb, truly, affords you elegant vacation living with a coastal ambience. The villa has four air-conditioned bedrooms. The master bedroom – in an individual pavilion adjacent to the central pavilion – has a four-post and draped, double bed, as well as a dedicated bathroom with a fitted bathtub and a rain shower. The master bedroom has direct access to the infinity pool. Each of the three guest rooms either has twin beds or a king-sized bed. All three bedrooms have dedicated bathrooms with rain showers. Aligned to the beach is the 17-meter infinity pool. After your morning dip in the ocean, give in to its beckoning, glassy fresh waters and continue your communion with your favorite element. For some sun, you can lie on ergonomic pool beds on the poolside tiled deck. But once it gets quite hot, seek the shade of the sala at one end of the swimming pool and recline on its cushioned, woven wood sofa or day beds – calmed by the waves gently announcing their arrival on shore. By the entrance of the sunny and breezy central pavilion is the living area. Around its large, leather sofas in front of a wall-mounted, widescreen TV, you can all anticipate the new episode of the latest blockbuster series. Or, relive the drama of your beloved classic movie. Behind one of the sofas is the dining area with its distressed wood table for eight. Here, you can all have your fill of authentic Thai specialties – as well as foreign fare – freshly cooked by the onsite chef at the fully-equipped and modern Thai kitchen in the central pavilion’s annex connected by a stone pathway over a pond. The kitchen has a counter with high chairs which doubles as a bar for breakfast, snacks, coffee or all kinds of drinks. In addition to cleaning and freshening up the entire villa, the attentive staff also administers services to assure that you definitely have an absolute ball. 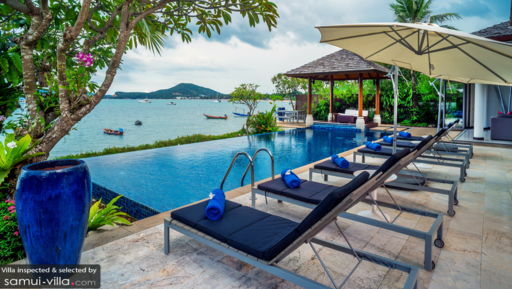 Baan Kularb is located along Bo Phut Beach where you can swim all you want – all day long. You can also comb the two-kilometer coastline and arrive at Fisherman’s Village. Amble about and appreciate its early Chinese, colonial French and Mediterranean ambience, as well as take advantage of the affordable shopping along its Walking Street which comes alive every Wednesday. On a day out of the villa, go see the Samui Big Buddha and the Samui Crocodile Farm. If you’re looking for something more active, check out Samui Go Kart or the Bo Phut Hills Golf Club. Fantastic accommodation. The property is really nice, pool overlooking sea. Staff offering a lot more service than we are use to, can't go to the fridge for a beer before someone appears to pour it. And they keep disappearing with Emily at every opportunity. Lots of restaurants within walking distance but the chef also very good. I thought I'd drop you a line and tell you how much our clients enjoyed their stay in Dhevatara Residence (Baan Maliwaan & Kularb). They loved the villas and were most impressed with all the staff. I just wanted to say a very large thank you to every one at samui villas. We all had the most amazing stay at the villa and the staff were fantastic. Please can you pass on our thanks to the staff? The chef made the most delicious food for us. Each and every person of our Company enjoyed our stay in Dhevatara. Your systems are absolutely fantastic The service by your Staff was perfect. Khun Nice and her team along with the Chefs had really put in a great effort to make our stay comfortable and enjoyable. We definitely look forward to utilize your services in future.